The script deserves a grade of B, the scenery, special effects and acting a B+, and the 3D version an A+! Definitely own this one, it’s worth it! Ever since the Star Wars: The Force Awakens film was announced, the anticipation was palpable. When the movie finally came out last December, the frenzy surrounding it was incredible and, even though some of the plot was recycled, it managed to deliver. Much to audiences' delight, it fed their sense of nostalgia and refueled their love of the Star Wars franchise. It also introduced some new, young talent. Earlier this year, the film was released on Blu-ray and DVD and now, in time for holiday shopping, the 3D version is coming to stores. For those who missed all the hype, Kylo Reno (Adam Driver; Girls) and the Dark Side are trying to get the map to where Luke Skywalker (Mark Hamill; Star Wars Episode IV: A New Hope) is hiding and, apparently, the rebel alliance has it. While looking for it, the Dark side also have been building what equates to a weapon of mass destruction (death star anyone?). Meanwhile, the map seems to have been hidden away inside a droid called BB-8 who is now hiding out on a desert planet with an orphan named Rey (Daisy Ridley; Scrawl). Finn (John Boyega; 24: Live Another Day) is a soldier under the Dark side, but he doesn't have the stomach for killing innocent people. Poe Dameron (Oscar Isaac; Ex Machina) is a leader in the rebel alliance who gets captured and taken to Kylo Ren. With Fin's help, Poe escapes and they head to find BB-8. After their ship is hit, Poe is presumed dead and Finn ends up teaming up with Rey to take BB-8 to the General/Princess Leia (Carrie Fischer; Star Wars Episode IV: A New Hope). With Finn's help, The Rebels destroy the weapon and Rey, using the map, finds Luke; hence, setting us up for the next installment where she will most likely train as a Jedi. Sound familiar? That's because some of it is. We've seen it before in previous Star Wars films. However, there are enough new elements, like the cast, to keep us interested. Ridley is simply fantastic as Rey and every time she is on screen you can't help but be drawn to her. Boyega and Isaac are solid and their "bromance" was all the buzz after the movie came out last year. Familiar favorites like Hamill, Fischer and Harrison Ford (Indiana Jones Series) give the audience a sense of nostalgia as they pass the torch to the next generation of actors. Driver plays Kylo Ren well as the conflicted bad guy who prays for guidance from his long dead grandfather, Darth Vader. If you saw the film in the theater in 3D like I did, you were hopefully struck by how well it was done and thought it was most definitely worth the extra few dollars you spent on seeing it. Well, if you own a 3D television, then you will, once again, want to splurge and buy the Blu-ray in 3D. The disc is even more impressive than the 3D theater version. The contrast in the depth of the objects in the foreground and background is dramatic and the quality is simply excellent. The 3D Blu-ray is presented in 1080p resolution with a 2.39:1 aspect ratio. While the picture is exceptionally clear, it does tend to be a little dark at times, which can happen with the 3D version as opposed to the regular Blu-ray. Despite that, the colors are beautifully rendered and run the full spectrum. The DTS-HD 7.1 Master audio is fantastic as every swing of the light sabers can be clearly heard with the familiar swoosh we have all come to know and love. The mix is also balanced pretty well between the dialogue and sound effects. NEW! Audio Commentary: Director J.J. Abrams discusses the history of the franchise, the process of making the film and gives insight into what he had in mind and how to make the film fresh while keeping in line with it's predecessors. NEW! Deleted Scenes while keeping the deleted scenes form the 2D release this edition expands slightly to include 3 more scenes. NEW! Foley: A Sonic Tale The Foley artists discuss what it was like creating the unique sound effects for the iconic film. NEW! Sounds of the Resistance delves into the classic sounds of the franchise while it discusses the new additions for this film and how they wee created. NEW! Dressing the Galaxy discusses the costumes of the film and how they play a part in the overall look, as well as to help shape the characters. As a fan of the franchise, I thoroughly enjoyed this most recent addition because even though it wasn't quite original, it still had enough elements to make it unique while staying true to the series. The script deserves a grade of B, the scenery, special effects and acting a B+, and the 3D version an A+! Definitely own this one, it's worth it! 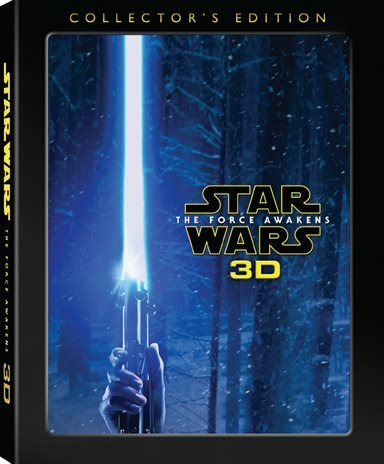 Download Star Wars: The Force Awakens 3D Collector's Edition from the iTunes Store in Digial HD. For more information about Star Wars: Episode VII - The Force Awakens visit the FlickDirect Movie Database.